This is a series about a certain purse owned by the Sangl Family. Unlike every other series I have written, I am NOT excited to be writing this one. On Wednesday this week, Jenn received a package at the house! Below is a picture! The purse with ALL of its contents – including cash, iPod, cell phone, and the kitchen sink were still there! I called the manager of the McDonald's that same day and profusely thanked them for their kindness and told her of her employee's great work. The reward has been mailed. It is substantial, and it is worth it. Congratulations! I am so glad for your happy ending to this story. Would you go so far as to say…it renews your faith in humanity? 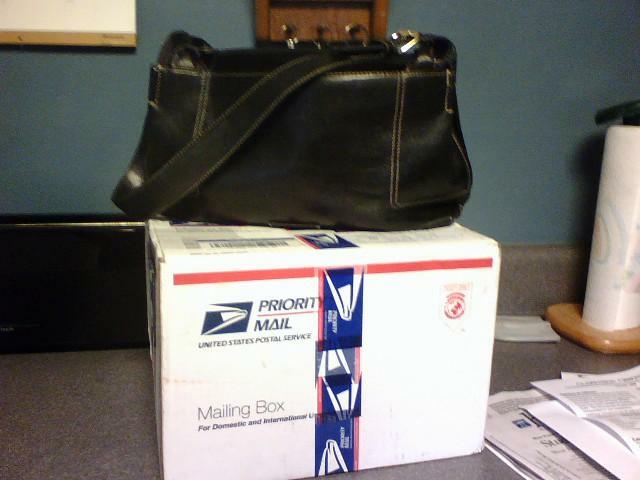 -Well…anyway it does our hearts good to know the purse was mailed back with virtually everything in tact!!! Praise God from whom all blessings flow. Awesome… I have no other words. I just read this entire series and literally my jaw dropped over this fantastic outcome!! Blessed is definitely what you guys are! I think I saw Joe carrying this bag around on Friday. The question continues,Is this really Jenn’s purse? Or is Joe just covering up his obsessions for accessories?